Going Digital with the Pander Bros.
One of my favorite runs of Flash comics was a brief twelve-issue sequence written by Grant Morrison and Mark Millar. During their short time on the series, the great Scottish writer and his younger protégé celebrated much of what made the Flash great – gimmick stories, the Rogues Gallery, super-races and a strong feeling of family – and delivered a run of comics that is a total delight. Currently in print in graphic novel form in two volumes as Emergency Stop and The Human Race, Morrison and Millar do a wonderful job of combining the humanistic stories that previous writer Mark Waid wrote for the series with the dayglo modern idea-packed comics that Grant Morrison wrote in the 1990s. In fact, Morrison’s approach celebrates the past, present and possible future of Flash comics, often all at the same time. That makes this run very Morrisonian. The Morrison/Millar era begins in Flash #130 (Oct. 1997) with “Emergency Stop” (with art by the solid but unspectacular Paul Ryan and John Nyberg). This is the kind of thoughtful Morrison yarn that looks back into comics traditions and forward into an exploration of possible futures at the same time. The issue begins with Wally West, the current Flash, taking his girlfriend, Linda Park, for a birthday dinner in the shadow of the Taj Mahal in India. The deep love between Wally and Linda is one of the key aspects of Wally’s tenure in the red suit, so the writers make a statement by placing the scene up front. 60 minutes? When you’re the Flash that may as well be an eternity! During the 1960s, The Flash often used a hook like this pull readers in. editor Julius Schwartz often presented an intriguing situation on the comic’s cover as an enticement for readers to spend their 12¢ on the latest adventures of the Scarlet Speedster. Morrison, who loves comics history, celebrated that trope here. It’s a mystery that grabs the reader and commands them to continue. This first issue of Morrison’s run is filled with other moments that echo the 1960s: the story is split into chapters, as Flash comics during the early Barry Allen years; tailor Paul Gambi (who sewed super-villain costumes in ‘60s Flash comics) cameos; and the villainous threats in this issue are very ground level, with many shots of Central City on fire. Even the first issue is a done-in-one, though it ends in an awesome cliffhanger: at the end of the issue, the Flash has broken every bone in his legs defeating the evil Suit. Wally’s not as lonely as he thinks he is. I love how despondent Wally looks in his wheelchair above. It’s a delightful moment, made even better by the fact that the next page shows that Wally isn’t alone. The Golden Age Flash, Max Mercury and Impulse have all come to visit him, and girlfriend Linda is keeping a happy smile on her face. It’s obvious that Wally won’t be mourning his broken legs for long. Though our hero is defeated, he’s hardly all alone. Again the theme of connection comes up in this series. It will come up many more times. As this second issue of the Morrison run proceeds, it feels more like a slightly acid-trippy version of 1970s Flash comic written by Cary Bates. The action has moved into the farmland surrounding Central City. In this issue, Morrison presents a series of scenes that shake the reader up and play with the status quo just a bit. 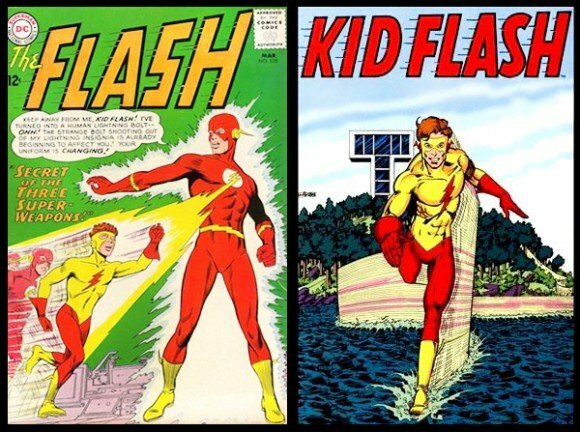 Impulse dons the Flash suit, Max plays with the suit in a different way than Impulse, and the villain seems more fearsome than before. Man, that suit glows! It’s bright and glossy and sparkly and seems like something that might have emerged as the new Flash costume after Crisis on Infinite Earths if level heads hadn’t prevailed. Typical Morrison, the suit is as much a look back as it is a look forward because it also invoked Wally’s Kid Flash costume of the ‘60s and ‘70s. This issue’s high adventure, slam-bang action ends with a moral dilemma. Wally is showing greater power than he ever had shown before. The villain is defeated but that defeat has come at a great cost. And again an issue ends with a great cliffhanger as the last page introduces a threat from the Mirror Master. The Rogue has somehow turned Linda’s life into a mirror and therefore threatens her life. Mirror Master is one of the Flash’s classic villains, so in a run like this it was virtually required for him to show up. (It’s slightly disappointing that only a handful of other Rogue’s Gallery members show up in this run). The villain’s powers are stronger than they ever have been. In one awesome sequence, the Flash runs into a prism at lightspeed and comes out as multiple different bickering versions of himself, all reflecting the color of their body. (This idea was used much later in Blackest Night). Typical for Morrison, this sequence is a clever little throwaway from the writer who was a virtual idea machine. In the hands of other writers, this idea could spark an entire story arc. Under Morrison, this idea spawns a cute two-page segment. The ideas flow fast and furious in this story, with lots of clever images that beautifully show the joy of super-hero comics. Mirror Master traps a whole bank vault inside a hand mirror, the Flash grows huge, a time paradox creeps in. These are dense, action packed comics that never seem to slow down. “Still Life in the Fast Lane,” the story in Flash #134 (Feb. 1998), is one of the best stories ever to feature the Golden Age Flash. It presents a charming meditation on getting old, on preserving a marriage for 50 years, on the value of friendship, and on the pain of lost memory. At the heart of this delightful issue is the boundless optimism of Jay Garrick, the man who first took the Flash name. After the first volume ends in a complexly forgettable heroes-in-the-courtroom tale that crossed over between issues of Green Arrow, Green Lantern and Flash, volume two begins with my favorite storyline in this set of issues. If “Emergency Stop” was all about celebrating the Flash’s past, “The Human Race” is all about celebrating the glories of imagination. It starts slowly, with young Wally West somehow contacting a creature called Krakkl from another generation, then quickly switches over to a hero from another dimension who has crashed to Earth. As Wally and his friends investigate, the story becomes one of Morrison’s glorious larger-than-life epics. Space gamblers who resemble Kirbyeqsue type gods come to Earth and command the Flash to run a race, lest the Earth be destroyed. What follows is classic Morrison approach applied to the Flash. Morrison delivers unimaginable, unreasonably, completely alien creatures. He delivers Wally West trying to bring his humanity and problem-solving skills to an unintelligible threat. Morrison delivers alien cultures that thrill readers with the strangeness and detail of their strange worlds. And most importantly of all, Grant Morrison delivers a story that keeps the relationship between Wally and Linda at its quickly beating heart. That keeps love and humanity at the center of this story and adds urgency. For three issues, Wally races his former imaginary friend across galaxies, time and space. They run through black holes and to the age of dinosaurs. They never slow down because they’re heroes. They experience terrible pain and keep their legs churning to battle a threat far worse than they could imagine. That’s just what heroes do. That said, though the resolution of this storyline is sweet and delightful, it also is classic Morrison in another way: at some point Morrison seems to lose the some of the loose ends in his plot. There’s a crucial and ironic thread in the story that Morrison seems to forget. It seems that the person who wins the race to save their planet has to keep running races against other planets until they lose. That seems a vitally important plot point, and causes Wally despair and angst, until it simply stops being an important plot point. Morrison has several other moments like that as well, where ideas are coming so fast and thrillingly that he sometimes seems unable to slow down at all. Of course, for a comic about a speedster, that’s an ironic statement. The final storyline in the Morrison/Millar run, “The Black Flash”, is an unintelligible dud dragged down by horribly distorted art by Pop Mhan, but it doesn’t detract from the rest of the stories that the writing pair deliver. In their twelve-issue run on The Flash, Morrison and Millar deliver a set of stories that seem impossible. These stories celebrate everything that came before while adding a radical new take to them. Or perhaps it wasn’t impossible. Morrison’s JLA was full of the same manic pop thrills that these comics deliver. They’re fast. They’re exciting. They’re classic Flash. One thing that charmed me about “The Human Race” was that Krakkl is very obviously a version of the “Foxy” referenced in ANIMAL MAN. So Morrison wrote his childhood imaginary friend into the DC Universe!